spies who landed off the coast of Scotland in late September, 1940. The German spies who were sent to England from September 1940 to January 1941 were often equipped with a cipher disc to encipher their radio transmissions back to Germany. Cipher discs were first described in a 1467 treatise by Leon Battista Alberti, an Italian Renaissance Man. Two discs, one larger than the other were pinned together and rotated around the pin. The message letters were commonly on the outside of the disc and the ciphered results were on the inside disc. Thus, using the disc at right, the word "cipher" would become "hwepgx". 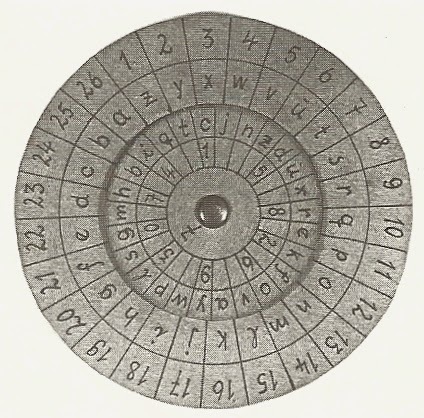 A variation of the Alberti cipher disc was also used during the American Civil War. The Germans took the standard cipher disc and added their own particular twist to it, adding numbers on both the inside and outside wheel. 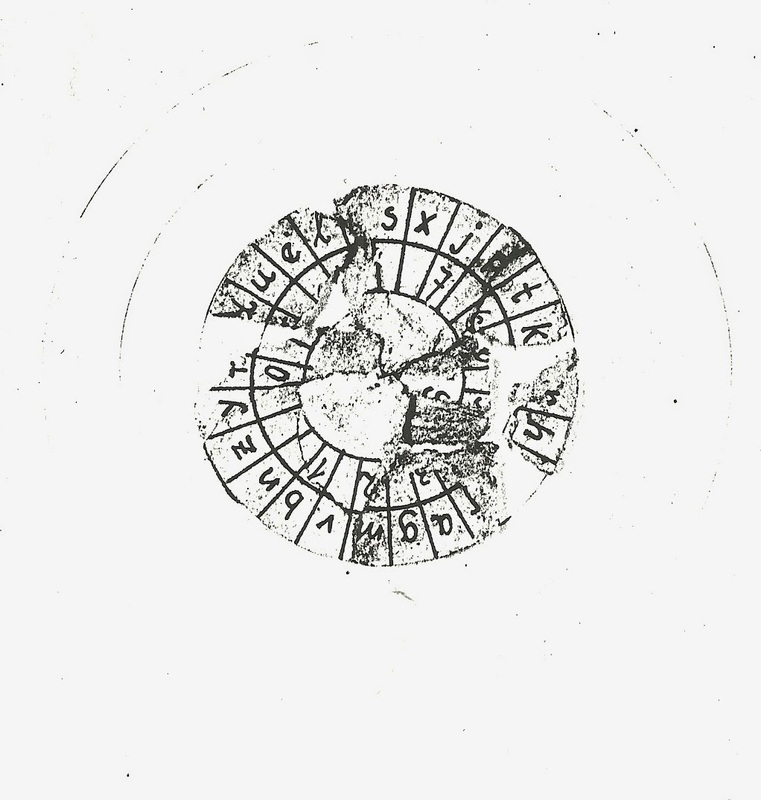 Handwritten on heavy card stock, the German cipher discs varied from agent to agent but were helpfully numbered sequentially by their spymasters. Outer circle of Josef Jakob's cipher disc. When Josef Jakobs parachuted into England on the evening of January 31, he was crippled by a broken ankle incurred while leaving the German aircraft. Sometime during the night, or early in the morning, Josef took his cipher disc and tore it up into small pieces and scattered the pieces on the ground around him. When he was found the next morning, members of the Home Guard and Ramsey Police gathered up the torn fragments of the code and sent them off to MI5. Inner circle of Josef Jakob's cipher disc. 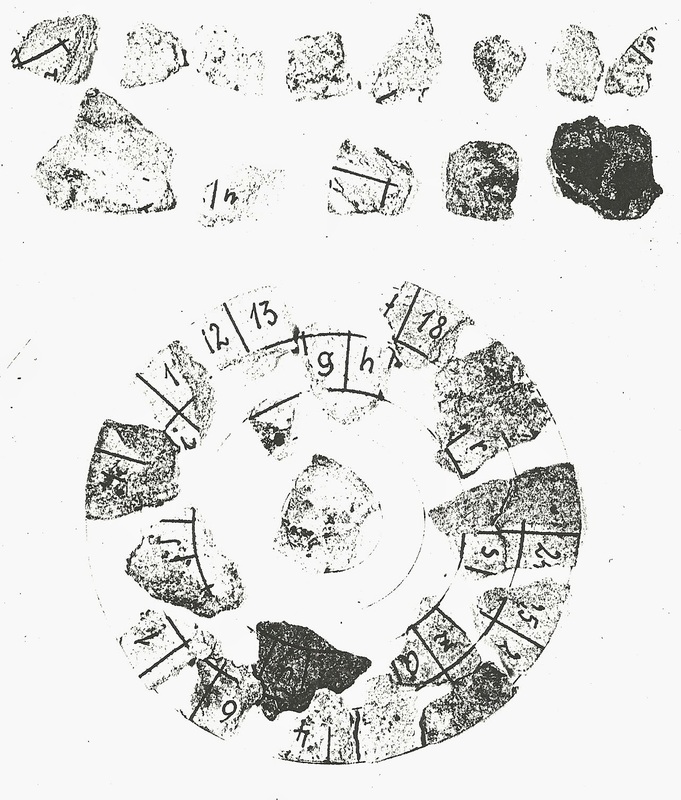 The cipher disc fragments were sent to the cryptology experts at Bletchley Park where they were partially reconstructed. From the fragments Lt. Col. William Edward Hinchley Cooke of MI5 learned that Josef's cipher disc was numbered 9. That was particularly worrisome to MI5 as the last two cipher discs, confiscated from the German spies who arrived off the Scottish coast in late September, were numbered 6 and 7. Where was the cipher disc numbered 8? In April of 1941, a dead man was found in a public air raid shelter in Cambridge. He had committed suicide with a pistol and it was eventually determined that he was a German spy who had eluded capture in England. Jan Willem Ter Braak (real name Engelbertus Fukken) had landed in early November 1940 near Cambridge and had managed to live undiscovered in Cambridge for several months. Having run out of funds, and with no fresh supply from Germany, Fukken took matters into his own hands and shot himself. His radio transmitters was found at the Cambridge Railway Station Left Luggage area. It is quite likely that his his cipher disc was numbered 8. As for Josef Jakobs, the fact that he had torn up his cipher disc did not bode well for him. MI5 interpreted Josef's act, committed during the pain-filled darkness of a frigid January night, as a hostile act. Had Josef really intended to help the English, they argued, he would have handed his intact cipher disc over to the English authorities when he was captured the following morning. Josef said that he had been overcome by pain and was afraid that peasant farmers would treat him harshly if they saw obvious spy equipment. The officers of MI5 and the members of Josef's court martial did not agree. Other German agents had also disposed of their cipher discs and/or codes prior to capture. Josef Waldberg and Karl Meier who landed along the coast of Kent in the darkness of an early morning in September 1940 had dumped their circular codes overboard after hearing a British patrol boat in the distance. Perhaps Josef had lost his head because of the pain of his broken ankle, but his pleas were of no avail. 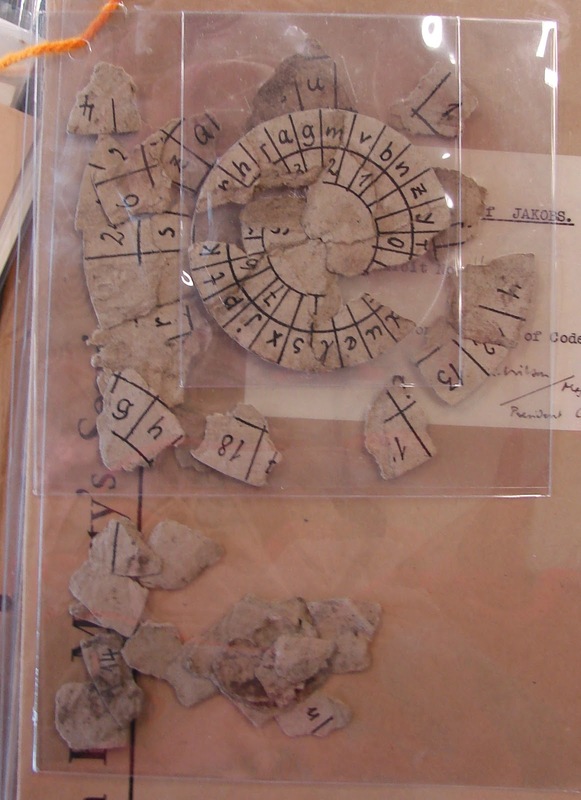 In the end, those torn fragments of a cipher disc sealed Josef Jakobs' death sentence. German Spies in Britain, After the Battle Magazine, Volume 11, 1976.